The apparel industry is an incredibly diverse landscape, driven by the creative minds of hobby designers and large fashion houses alike. The dynamic nature of the fashion world acts as a creative outlet for many, encouraging expression through design. This can be interpreted in a variety of different ways; some designers use apparel as a reflection of cultural influence, while others create garments simply for aesthetic value. Regardless, there are multiple techniques designers can use to achieve the look and message they desire. Textile printing is a versatile technique that allows designers to tailor the message of their collection using color, design, and patterns. It provides flexibility beyond fabric and color choice to influence the overall perception of their garments. Take Raf Simons’ fall 2001 collection for example: After a yearlong sabbatical in Eastern Europe, Raf was inspired by the youth’s use of layers and oversized garments to cope with the frigid climate. The bulky aesthetic was a stark contrast to traditional clean lines and slim cuts, but it was his use of edgy prints and patches that made this collection so revered. Printed photos, graphics, and text were his expression of obsession, intensity, and authenticity, which left a lasting impression on his audience. The point is; textile printing creates opportunities for designers to go above and beyond what is possible with their choice of color, fabric, and cut. It allows them to express thoughts, inspirations, or even references to popular culture that wouldn’t be possible otherwise. Sound expensive? It’s not. 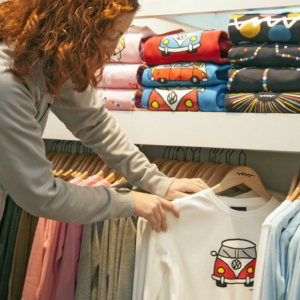 Textile printing is one of the most cost-efficient ways to customize your garments, and there are so many ways to do it. 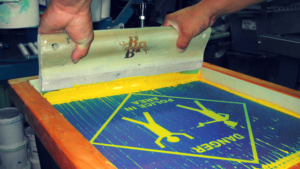 What is heat transfer/vinyl printing? There’s a lot to textile printing, and it’s just one part of the development process. Download the production checklist we use with all of our clients to see everything you’ll need to get started – and we’ll throw in our costing template, fabric & trim directory, and development cheatsheet too.